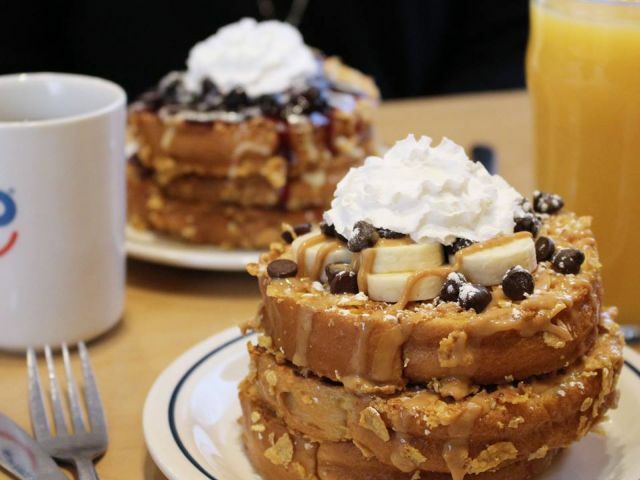 IHOP returns Double-Dipped French Toast for a limited time with two new varieties. The dish features brioche bread dipped in vanilla batter and then again in corn flakes and oatmeal before being griddled. The flavors are different this time around with new Blackberry & Vanilla as well as Banana, Peanut Butter & Chocolate. Blackberry & Vanilla sees the the Double-Dipped French Toast topped off with blackberries, a drizzle of vanilla sauce, powdered sugar, and whipped topping, while Banana, Peanut Butter & Chocolate features sliced fresh bananas, chocolate chips, a drizzle of Reese's peanut butter sauce, a dusting of powdered sugar, and a dollop of whipped topping. Double-Dipped French Toast was first introduced last year in Cinnamon Sugar and Lemon Strawberry flavors. The menu item can be ordered in a stack of two or three or as part of a combo. It's available at participating IHOP restaurants through April 10, 2016.